Into the Woods – on stage – isn’t a particularly good musical. Therefore, a film adaptation isn’t likely to be a particularly good movie. People who are disappointed with Rob Marshall’s cinema adaptation tend to focus on the textual changes, which were relatively few. Compare On the Town, considered one of the finest musical movies: it threw out all but two of Leonard Bernstein’s songs. Here, a mere handful of airs were left on the cutting room floor. So stop whining! Their inclusion wouldn’t have made a major difference. I can’t say I was disappointed by the flick. A very strong cast filled the multitude of roles. Some thought was given to the look of the thing, and that paid off considerably when two princes warbled in front of waterfalls. By trimming away some ballads from the second act, the pace of the piece increased towards the end. When I see Into the Woods on stage, it always seems terribly long, leaves me exhausted. This adaptation didn’t have that effect on me. So, let’s look at why Into the Woods isn’t such a good musical to begin with. And also why filming it is a fool’s errand, bound to highlight its weaknesses. When you look at the great musicals – Carousel, West Side Story, She Loves Me, The Most Happy Fella, e.g. – one thing that stands out is emotion. The best shows amplify and explore characters’ feelings, their passions. Writers make a choice about what to emphasize in their storytelling. Rodgers and Hammerstein spend a large amount of time on Julie and Billy’s first date in Carousel, the famous “bench scene” concluding with If I Loved You. And God, that’s some gorgeous writing. Hammerstein’s pupil, Stephen Sondheim, rejected that example and chooses, in show after show, to emphasize something other than ardor. He’s interested in showing ambiguity (“Getting a divorce together that make perfect relationships.”), malevolence and regret. One of the things that stops his most performed show, Into the Woods, from being a great musical is its refusal to stop and explore what anyone is feeling. The first act zips along without pausing to come up for air, much. It’s all plot, almost all the time, and perversely avoids depicting its most piquant emotions. A couple that wants a child but cannot have one – that’s a very moving problem, there – is given the opportunity to conceive. Wow. A true reason to pop the champagne. But Into the Woods, with too much story to tell, doesn’t have time to lift the cork. Now, eventually this couple gets a vaudevillian paean to teamwork, one of the best moments of the play. And teamwork’s a nice thing, but fertility’s ever so much joyful. In Murray Schisgal’s play, Luv, two woe-begotten schlubs try to outdo each other with who’s had the more miserable life. “For Christmas presents, we got socks!” “You got Christmas presents?” In another of Into the Woods’ more winning moments, royal brothers boast they feel greater Agony than the other. And that’s pleasant and amusing, but, again: where is the love? We never experience what either of these men feel about their ladies. At another point, the show admits it has nothing to say about romance “He’s a very nice prince.” “And…and…?” This leaves us with no reason to have a rooting interest in anyone’s marriage working out. It’s rare to find a musical with so little interest in love – for good reason. A couple of posts ago, I pointed out how unrelenting verbosity creates a strain on the audience’s ears. You get exhausted by all that painstaking ear-cocking. With Into the Woods packing ‘em in at multiplexes, a lot of audiences are experiencing the lyrics for the first time. And their brains are hurting. We theatre folk, the people who know the show well, who’ve listened to the cast album or video countless times, tend to forget how hard it was to take in all those dense words on the first encounter. Into the Woods, I maintain, is a show people grow to love. When you re-encounter it. Dozens of times. There are bugs on her dugs. There are flies in her eyes. And you read that, and it’s pretty clever; you’ll smile if you get it. 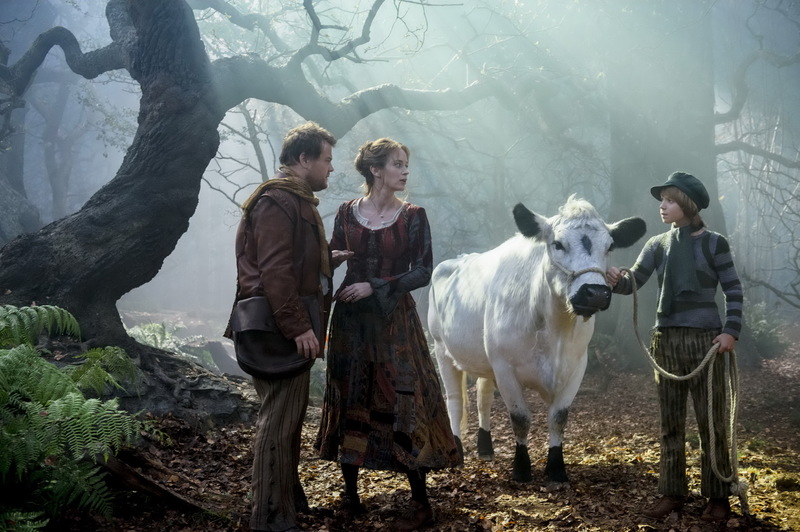 In the movie, you see a real cow and you’re hard-pressed to comprehend “dugs” and the whole triple meaning of “wither.” The image – an old white cow – said it all; nobody in the audience laughed at the triple entendre because we’re not used to figuring out homophones at the flickers and Look! A cow! Another stagy thing not easily replicated on celluloid: We accept the idea that juvenile characters won’t always be played by actual children. Central to Into the Woods is the awakening of Jack (of beanstalk fame) and Little Red Riding Hood. 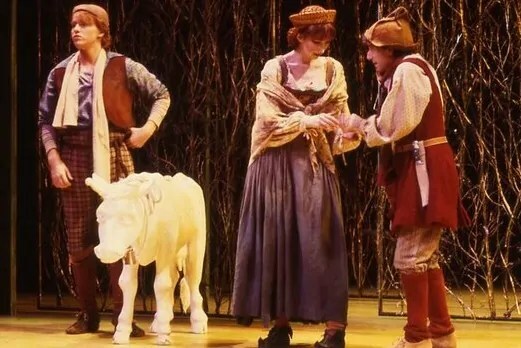 Creators James Lapine and Stephen Sondheim could have a little fun about fairy tale characters having a sexual awakening because they knew, when the show was produced, they’d be casting performers in their late teens. The boy and girl originating these roles on Broadway were 18 and 16, and nobody got embarrassed by the idea that performers that age would be aware of, and could hint at, the sexual overtones: the wolf’s use of “carnality” as he salivates over eating the “supple” girl, her being excited and scared and Jack’s close encounter with a giant breast. Contemporary filmmaking doesn’t have a tradition of adult actors playing pubescent characters. And so, three key songs are robbed of their sexual heat and it’s not clear to me what, of any importance, Little Red knows now that she knows things now. Or what Jack knows that’s different than what he’s known before. And why is the film spending time singing about it? My theory is the authors were so preoccupied with moral quandaries and other would-be profound bits, they failed to serve up much that’s moving. And do we go to flicks for their philosophic epiphanies, or their emotions? I used to feel we writers-of-musicals were part of a club where age truly didn’t matter. Back when I was the youngest member of Lehman Engel’s workshop at BMI, there were plenty of gray-hairs in the room and I didn’t feel a great generational divide. Now that I’m older than most musical writers, I’m sad to report I finally feel it. Could be I’m encountering young people who don’t care about the same things I’ve always cared about. They heedlessly (and needlessly) make craft mistakes Lehman Engel would have balled them out for. They’re seemingly not bothered by music or slang that takes the listener out of the setting of the show. Oddest of all, there’s a de-emphasis on romance, as if they’re embarrassed by the emotion. Also, they’ve a markedly different belief into what sort of story is suited to musicalization. I grew up listening to my parents’ collection of original Broadway cast albums. These few dozen discs represented the very best of the Golden Age, from Oklahoma! to 1776. I wore out the vinyl, and – I know this is odd – didn’t listen to pop, or the radio, or American Bandstand. Even as a kid I was only interested in musicals. The lyrics, generally set to hummable melodies, hit the ear smoothly: Everything about them, the verbal tricks, the imagery, the intervals, the character’s subtext – could be instantly understood and enjoyed. In contrast, rock lyrics were something of a puzzle: they usually didn’t mean much the first time you heard them, but repeated spins on your turntable might reveal layers of meaning, as in poetry. Broadway tunesmiths were more interested in telling a story, in being witty, in moving an audience. They utilized tools such as perfect rhyme, ear-friendly melody, and a consideration of how quickly hearers could comprehend concepts and phrases. Popsmiths had a different agenda: Could you dance to it? or, Did it reflect the alienation of youth? When I hear younger musical-writers who don’t use perfect rhymes, who emphasize rhythm over accessibility, who hurl concepts like hailstones, I think, “Well, they can’t have grown up listening to musicals. This sounds more like pop.” Stuff you hear on the radio can always get away with false rhymes, nonsensical su-su-pseudo-words, and overly dense ideas. And I just realized how much I sound like an old man by saying “hear on the radio” as nobody listens to radio any more. But consider: I limited myself to fewer than fifty albums representing the best of Golden Age musicals. With Spotify and YouTube today, I doubt anybody’s curtailing their playlist to that. Good theatre composers are like chameleons, really. Sure, everybody has a style, but the pre-eminent practitioners change their skins, in a way, when meeting the challenge of telling tales in different settings. My composition teacher admiringly pointed to Frederick Loewe, who sounded oh-so-Edwardian-England in My Fair Lady, sacre bleu!-so-fin-de-siècle-French in Gigi and so Wild West in Paint Your Wagon, you imagine tumbleweeds getting caught on staves. So, do you love a good reggae? Who doesn’t love a good reggae? 25 years ago, there was this musical, set on a Caribbean isle, and a vivacious young woman gets introduced with a bright reggae. Who doesn’t love a good reggae, right? Because if your character’s from the Caribbean, it makes sense that… Wait a minute! Cathy’s not from the Caribbean. She’s a white chick struggling to learn which Central Park West buildings contain which celebrities. Brown’s choice of a reggae for this character in this particular time and place seems totally arbitrary. Almost as arbitrary as giving a peppy salsa to a Jewish character. Younger people never seem to be bothered by this. While I’m thinking of The Last 5 Years: Did you ever notice how its stronger moments depict disharmony within a relationship? There’s very little of the lovers saying “I love you.” And it’s not just The Last 5 Years: the inability to give soaring expression to amorous feelings is a wide-spread problem in this strange new world we live in. There was a time – LONG BEFORE I WAS BORN, thank you – when people naturally looked to musicals for passionate outpourings. If Rodgers, Berlin, Porter or Gershwin saw the musicals of today, I think they’d find the lack of love songs the most surprising change of all. I’m tempted to lay this at the feet of Stephen Sondheim. In the 45 years since he became widely-admired, he’s given us precious few celebrations of amity, along with many searing portrayals of enmity, of love gone wrong. Those who consider Sondheim The Great One often aspire to follow his every move; their output has been long on hate songs, short on love songs. So, where once shows celebrated happy romance, now they excoriate and criticize. You’ll note my latest musical, The Music Playing, details a married couple’s successful ascent out of tough times. And yes, I’m dreadfully old fashioned in my insistence that musicals should contain, somewhere, an un-ironic positive romance. Many a younger person thinks me mighty strange for creating a show in which people love each other. Well, the feeling is mutual: If you’re working on something truly tragic or relentlessly sad, I scratch my head. This month, a Broadway revival of a Broadway flop closed deep in the red. And a lot of people sound surprised that not enough people wanted to buy tickets to see the sad lot of Siamese Twin sisters during the depression. If you think that’s a good idea for a show, you’re probably younger than me. I’ve actually sat through a cutting of a musical based on Schindler’s List, heard several songs from one about the Lindbergh kidnapping, and my taste led me to avoid shows about Leopold and Loeb, Kitty Genovese, Columbine and tons of others. The truly tragic “sings” to a lot of novice writers. Me, I feel that musicals have an idiosyncratic knack for celebration, for boosting joy. Noel Katz’s wonderfully funny and beautifully touching Such Good Friends, one of the best musical comedies I’ve seen in years…Though the story is a grim one in American history, Katz’s main characters are all funny people who use humor as both a defense mechanism and a weapon, so there is always a realistic lightness at the surface. I’m a man of few words. I know: you want to call shenanigans on that one. After all, the average size of these essays is about a thousand words, WAY longer than what you find on a lot of people’s blogs. So what gives? As a lyricist, I like to think I appreciate the value of concision. My songs tend to be WAY shorter than other people’s songs. But what’s on my mind now is the issue of wordiness. I’m finding a lot of the new crop of musical theatre writers are far too wordy for their own good. They never use just one word when three, seven or twelve will do. This is leading to songs going on far too long. Certainly, the performer who’s able to stand and sing a gargantuan ditty will garner much applause, but it’s of the sort given to marathon runners, just for completing the run, not for a good time. But is the audience having a good time? That’s what’s most concerning. To me, a good time involves a certain state of relaxation. You lean back in your seat and soak up a well-harmonized tune wedded to a lyric with winsome turns of phrase and a soupcon of cleverness. It’ll wash over you, with ease. Now, what might the opposite experience be like? 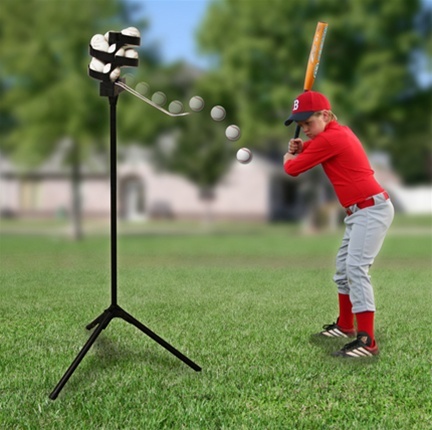 An unpleasant, or tuneless tune serving up a fusillade of syllables like a baseball pitching machine gone berserk. Lyricists who are in to proving they’re clever far too frequently pack a song with way too much verbosity; you have to ask whether that’s really clever at all. Composers fall into the trap of setting these to rarely-relenting strings of eighth notes, sometimes all on the same pitch. Why, in Jason Robert Brown’s most famous number, do we hear “stars and the moon and a soul to guide you” all set on an A? Back in my twenties, I fell into this trap with a number that needed to tell a lot of story, off-stage stuff we hadn’t seen. I had two comic characters to write for, but the quantity of syllables made the damn thing a chore to listen to. So, we cut the song, and the librettist provided a far-shorter couple of spoken lines that conveyed all we needed to hear. I learned a valuable lesson. So imagine my surprise that, so many years later, overstuffed songs have become common, and, in certain circles, praised. I wonder if these musical motormouths realize what they’re doing. When you unleash a torrent of syllables, you’re inevitably taxing the audience’s ears. The existence of music says, in effect, “Listen to this!” and then, cruelly, you give a much bigger bite than they can comfortably chew. The ears work hard to recognize each word. The brain works hard to make sense of run-on sentences. And that’s a hell of a lot of work to ask an audience to do. These good people have paid good money to see your show: Why do you have to treat them so miserably? I keep running into people who disagree with me on this, but I believe you get just one chance to affect an audience. Those people who’ve carved out time from their busy lives to sit in the theatre absolutely must appreciate your song the first time it’s heard. Now, I’m sure we’ve all had the experience of misapprehending a lyric the first time we hear it, then we get a cast album, play it over and over again, and, eventually, it’s all digestible. When you know a song well enough, your brain needn’t shift to overdrive in order to take it a complex concept. In this way, many a song that didn’t land in the theatre, seems brilliant and becomes beloved after hearers hear it again and again. How much money has the crowd that listens over and over forked over for the privilege? (What price Spotify?) Compare that to the price paid by the theatre-goer, and do include the cost in time and transit fares if they don’t live next door to your theatre. Where does your responsibility lie, writer? There’s something I don’t understand, so I’ll put it out in the form of a question: Why are the melodies thrown at verbose lyrics so dull? I just read someone’s opinion that Sondheim, in Into the Woods, didn’t want to distract from his lyrics by pairing them with an interesting tune. 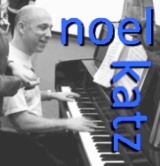 Now, I realize that the text that forces listeners to listen hard must be supported with proper cadences and stresses, and that can be a huge compositional burden, but what is gained by saddling a song with an ugly melody? DisneyWorld – I’ll go there twice! Is what you find amusing about that the adjective before “banana splits?” I tend to think of them as an anytime snack, myself. I hope you enjoyed your holiday season, filled it with frivolity, and enjoyed enough reviews of things that happened in 2014. Because I’m about to throw a bucket of cold water on all that. You see, when I look back on 2014, I’m immediately struck by a couple of disturbing and newsworthy incidents in the wide world of dramatic arts. True, they didn’t happen to musicals: one was a dramatic work of musical theatre that nobody mistakes for a musical; the other was a goofy movie. The crossbreed of those might be a goofy musical, and since I’ve written more than a few of those, the last part of last year was, in some way, a there-but-for-the-grace-of-God-go-I moment. If you’ve read this blog for a long time, you know that I urge creators to consider their consumers. Write with a specific audience in mind, I say. But, of course, one can’t always predict who’s going to react to your work. And, in the pair of problems I refer to, it’s a matter of people who never saw the work in question reacting strongly. The best known work of the John Adams I’m talking about is probably an opera about actions taken by a president (no, not John Adams, nor John Quincy Adams) called Nixon In China. I’m fascinated by the ambition involved in taking a piece of recent history and dramatizing it for the musical stage. Surely everyone walking in to the opera house already has some feelings about Mao Tse-tung and Richard Nixon, probably really strong ones. The musical dramatist deals with a hot potato. (I feel some remote kinship here, having dealt with Senator Joe McCarthy as an off-stage presence in Such Good Friends.) The response to Nixon In China – can you think of a more famous opera from the last half century? – inspired Adams to take on another dramatic episode from the not-distant past, the hijacking of the passenger liner Achille Lauro by Palestinian terrorists. And take another moment to consider how you’d create a work of musical theatre dramatizing that tragedy. Would you spend a lot of time convincing your audience that hijacking is evil? That killing innocent civilians is wrong? Does your audience really need to know that? It just flashed into my mind that my first year in college I worked on a theatre piece made up of Brecht excerpts, including The Jewish Wife. A director I respected derided it: “Wow: That show was really convincing that Hitler was bad.” Brecht’s works make a lot of interesting political points, but by focusing on the anti-Nazi material, the show had made the century’s most important playwright seem trite. I’ve seen a lot of musicals that preach to the choir the most obvious of messages. Does the audience need to be reminded Hitler was bad? Terrorism is bad? Cruise ships shouldn’t be taken over by machine gun-wielding thugs? Go beyond the obvious pieties. If I were writing about the Achille Lauro, I’d probably go into what the various characters were thinking. Their demands unmet, the terrorists decided to take a handicapped Jewish gentleman, who used a wheelchair, and push him overboard. What’s going on in the victim’s mind? I’d probably give voice to that, but I think it’s not nearly as fascinating as what’s going on in the minds of the murderers. This might remind you of Shakespeare, who reveals the inner thoughts of Macbeth and Othello. (Not coincidentally, these were adapted into famous and successful operas by Verdi.) In many a great work of art, we peek into the brains of very bad people. Crime and Punishment, anyone? So, the Metropolitan Opera decided to produce John Adams 1991 opera about the Achille Lauro, The Death of Klinghoffer. And a hew and cry was heard. Hundreds of protestors, including politicians, showed up with signs, chants and taunts at Lincoln Center. Their message was clear: How dare John Adams (and his librettist, Alice Goodman) give voice to Palestinian terrorists? They chose to kill Leon Klinghoffer because he was Jewish, so depicting this on stage is an act of anti-Semitism that must be condemned, and loudly. What were they so afraid of, I wonder? Would New York’s opera-goers, upon hearing Adams’ soaring arias for the terrorists, then decide to hijack another cruise ship? We all realize that the situation between the Palestinians and Israel is a subject of much controversy. The protestors seemed agitated over the idea that an opera depicting pro-Palestinian violence was somehow going to convert people to the pro-Palestinian cause. Does this make any sense to you? December brought a silly piece of cinema, The Interview. 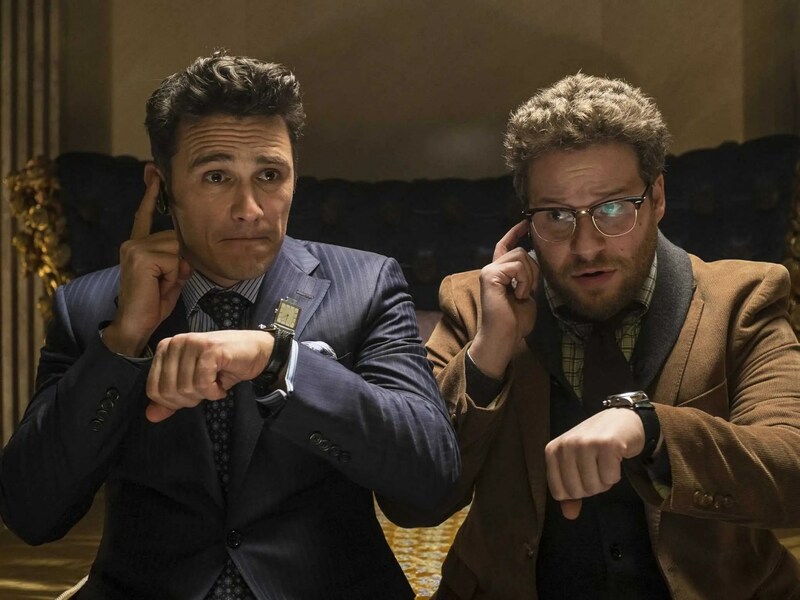 In it, Seth Rogen and James Franco are enlisted in a plot to kill the leader of North Korea. To everyone’s surprise, threats were made against the movie studio. Show this film and we’ll blow up the theatre – leading the studio to pull the film from its planned wide release. I’m no expert on risk-assessment, so I’ve no comment on whether too much caution was exercised. What interests me is what The Interview has in common with The Death of Klinghoffer. People, people who wield a certain deal of power, decided the public shouldn’t view these entertainments. And what gets my goat is that they came to that without having seen the works in question. Some opera protesters even admitted this, with perverse pride. We can’t be certain that The Interview’s threat-maker (thought, at one point, to be the North Korean government) hadn’t seen The Interview, but it’s a safe bet. I’ll come clean: I haven’t seen The Interview or The Death of Klinghoffer, but I just gotta say these were two battles between creators and those who sought to prevent these works from being seen. One side’s adding something to the world (even if it’s a low-brow comedy flick) and one’s subtracting from it. You are currently browsing the There's Gotta Be a Song blog archives for January, 2015.